Heidi Nilsen - Sharing the surf stoke. ‘Tis the season to start planning our spring camping trips. 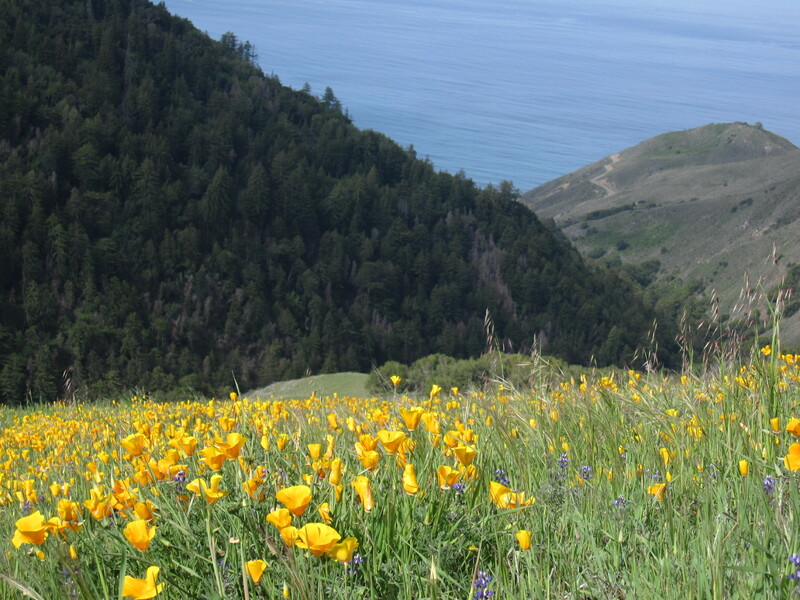 One of my most favorite spots is Big Sur. A little trickier now than it used to be as the campgrounds require reservations AND for the most part, if you want a killer campsite, you need to book wayyyyyy in advance. My pop up would be hideous in high heels. I can barely walk in high heels. Perhaps a nice thick wedge would work…oh, I digress. Anyway, this is a rather captivating video. I couldn’t stop watching. Have a peek! For the Surf Diva in your life! Not much swell, so been creating new designs! This “Surf Diva Triple Wrap Bracelet” captures the essence of the beautiful blue/green waves we pray for with a touch of black for a night on the town. 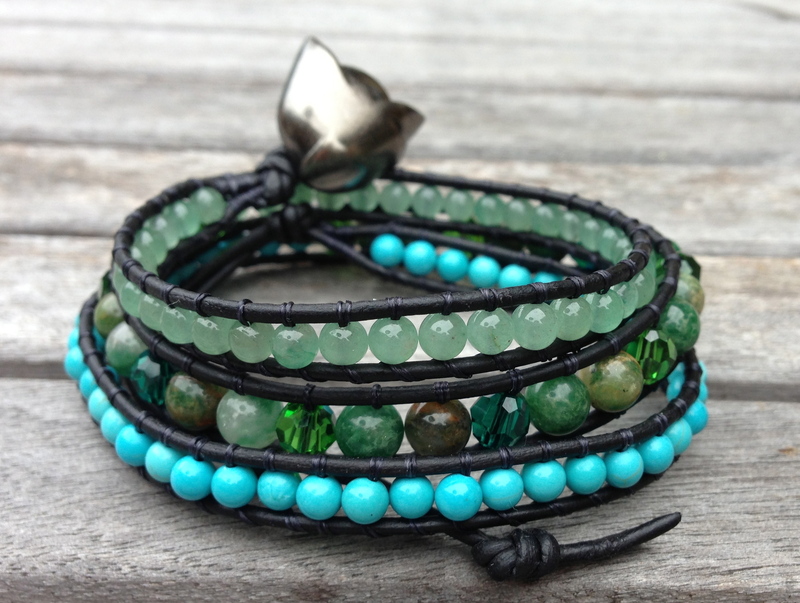 Handmade with 4mm and 6mm Aventurine (instills leadership), 6mm African Jade (said to bring good luck and enhance expressiveness and intelligence), 4mm Chalk Turquoise (for inner peace), green Swarovski Elements Crystals and natural black leather and black thread. This bracelet is shown with a unique tulip shape gunmetal button although I use various silver colored buttons depending on availability. To celebrate the 4th of July, I’m extending a special offer of $79 for this gem (normally $99) for all orders placed by midnight on 7/7. I have 3 in stock – first come first served for quick delivery. Looking forward to making you a beautiful bracelet while I wait patiently for waves! Jay Moriarity – Who’s He? OK. If you live in Santa Cruz, you don’t have to be a surfer to know who Jay is. If you don’t, please take just a couple minutes to check out this video showcasing some amazing footage of Jay surfing our favorite Santa Cruz spots as well as, of course, Mavericks. Jay–an incredible waterman. But more importantly, an incredible human being with an amazing outlook on life. The interviews woven in this piece reveal the positive impact he had on many people in our community. The Jay Race in Capitola today honors Jay, his spirit, and philosophy on life. He was truly infectious and still is, from another place. It’s a perfect day to head to the beach so come on down and be part of the celebration. I didn’t know Jay personally. I wish I had. Mostly because I like to surround myself with people who have a positive attitude. It rubs off on me, makes me a better person, and then I feel empowered to share that energy with others. Meet Gerry Lopez this Friday 6/21! “Mr. Pipeline” himself is in town this weekend for the Jay Race (more on that in a future post). I’ve met Gerry before and he’s the most gracious man. Listen to some of his stories by visiting Covewater SUP of Santa Cruz this Friday from 6:00 – 8:00 PM. While you are there, be sure to talk to the owners, Scott and Leslie, and check out their Spring SUP Sale! I picked up the 9’0″ Covewater Nohea Women’s SUP and LOVE IT! Lightweight, stable, fantastic beginner/intermediate board for cruising the bay. P.S. Photo courtesy of Covewater. It’s so hard to capture a good shot on my little iPhone. But the size today was amazing, and the shape! From the Hook to the Point was a short boarders paradise. I thought I’d get a jump on things…I got up at 5:30 AM, coffee in hand at 6:00 to check out the waves and decide what board to take. As I approached the cliff I could hear the waves pounding. Then, I saw the scene. At least 100 people. Spread out but there they were, like little ants compared to the sets rolling through. And at 6:00 AM! In any case, I watched the show and it was incredible. 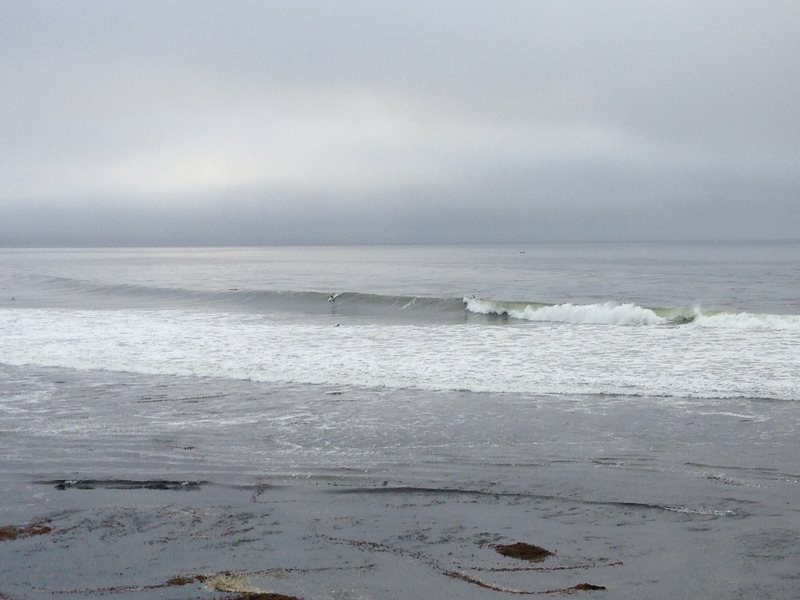 Surfers were getting tubed at the Drainpipe – a rare sight to see, perhaps only a few times a year here. So, it was really cool. I decided to wait it out and surf a little later. I chose a different spot a little mo’ betta for long boarding. 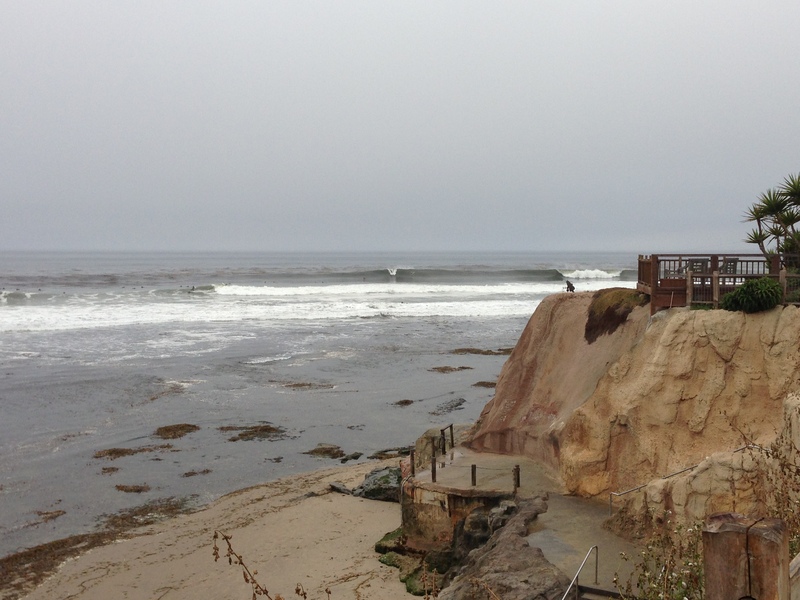 Not telling where – but I had a great session on my 8’0″ Johnny Rice Quad Piglet. If you’re not gonna go get some waves this weekend, at least spend some time watching the local pros. Something you’ll remember. 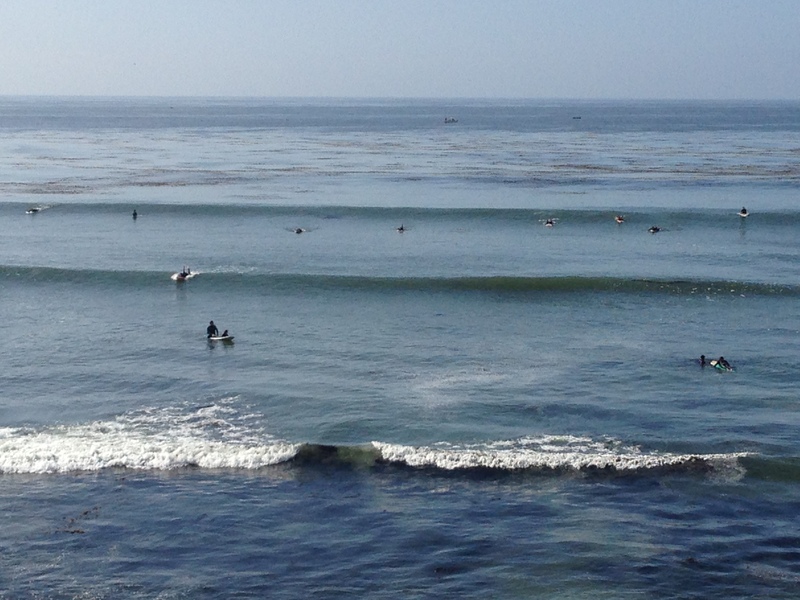 Just a quick shot of the tasty little (and some not so little) waves in front of Jack’s. I’m exhausted as I’ve been surfing so much. Hope all are enjoying a wonderful weekend in our little slice of heaven–Santa Cruz! Follow to get alerts of new posts by email.